Today's topic for the Tuesdays on the Run Linkup (which I've been LOVING being a part of!) is "Why I Run". I love this topic, and it'll give me a good chance to tell you all a bit about my running history. This is a lengthier post, so if you'd like the short version, read this article I wrote for Huffington Post, right before I ran my first marathon. I started running when I was 8 years old, because my sister and dad would go out running at a park nearby. I really wanted to join them, and my parents finally let me when I turned 8. It was love at first stride, and I couldn't stop running. 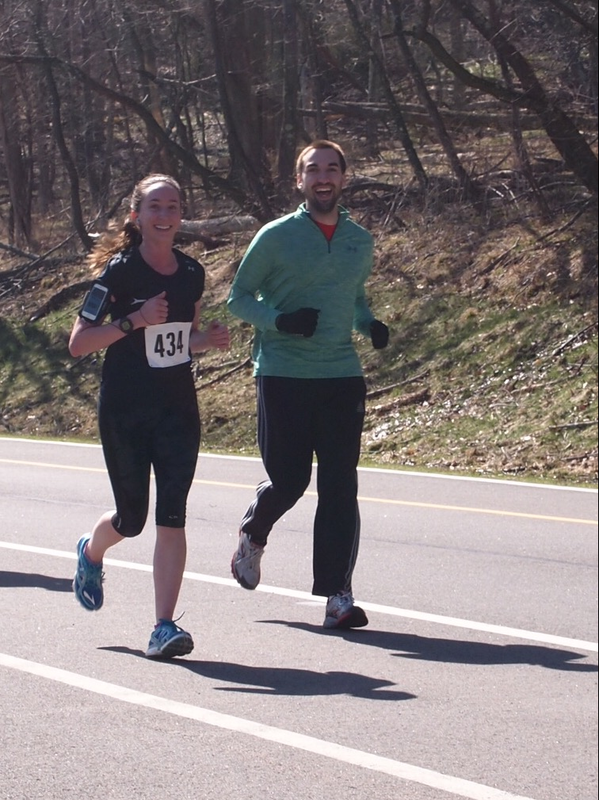 I did my first race when I turned 10 at the same park- the Brighton Heights 5k. I ended up beating my dad and sister, and finished in the top few women! My first race. Notice all the white cotton t-shirts..running was really different back then! From then, I didn't want to stop running. My dad, sister and I formed "Team Braun" and ran tons of races in the area, usually winning our age groups. This was before running was really popular, so everyone in the running community in Pittsburgh knew about Team Braun! I ran my first track meet in elementary school, where I did the 800m (the longest distance they offered). I ended up in third and my parents made fun of me because I spent some time waving to everyone in the stands who were cheering instead of focusing on the run! In middle school, I ran for the cross country team, and ended up winning the championship and setting the record for the course! For all you Pittsburghers, this is at the Schenley Park oval. This is still where city league meets are! I continued to run in high school, doing cross country and indoor/outdoor track. It was around this time that I started to burn out and didn't enjoy running as much. I didn't look forward to long runs with Team Braun, I hated going to the track and running intervals, and I especially didn't like our weekly lifting session as a family. All that hate culminated in a pulled hamstring during cross country practice my junior year. I finally shut down and realized I would never be as good as I used to be and I would never set records again. I took some time off, but finished out my high school career in cross country and track. When I went away to college, I decided to stop running. I had my years of glory, but didn't care about the sport any more. I focused on Blue Band and my school work, and never thought I would ever run again, except for the 2 miles or so I would jog on the treadmill at the gym once in a while. Happy to be running again and sharing my love with others! Ever since then, I realized exactly why I run, and why I could never stop again. Running makes me a better person..one mile at a time. What a great story about how your running evolved! Great post! I feel the same way about running that you do - I'm glad you were able to find your love for it again! Great write up. I think sometimes we just all need a break from something. I never loved running when I did sports because it was never made to be fun. Once I got back into running and saw I was doing it for me and I was calling the shots, I loved it right then and there. I understand that completely. It felt more like a chore or something back in HS, now it feels like a choice with less pressure so I enjoy it much more! Isn't it amazing how your mindset changed? I started running in my early 40s because basically I was looking for "something". The only big thing I had in my life was water skiing and you can't do that year round. I needed a challenge...something to do with myself. Your happy running pic is awesome! I love hearing why people started to run!! I ran the 800 meters in highschool too, it was my favorite event. I started running almost the same reason as you. I had family members that did it and once I started I was hooked. Wow - I had no idea you had such a history of running! I enjoyed the recap. My family is not active at all, and so even now, they don't really get excited about my races or understand why I spend so much time training. Mike's parents, on the other hand, were super active and they would always attend races together as family and his sister still meets their dad once a week to go for a run around the park. I kind of wish I could had that kind of relationship with my sister & parents growing up, or that I could do something like that now. Oh well, maybe someday if we end up in the same city as Mike's parents (they're from Australia), we can meet them too each week for a family run! That's so interesting how different you two are, yet you're both big runners now! Dan also grew up in a not-so-active family, and didn't start running til he met me. Thanks for sharing! Love this love story to running. I wish I loved it that much! I am getting to like it better, and reading your posts helps a lot! That's great to hear! I would rather pass on my love for running and get more people started on their journey than win another race. I'm so happy I'm helping you like it more! We have such similar stories! I can't wait to meet IRL one day and share some! Such a great story!! Running definitely helps to make me happier. Its also a great stress reliever. What a great running history and I love all of those photos! I remember doing my runs in cotton t-shirts and bike shorts! And all of those are great reasons to run! Thanks for linking up with us! I loved reading your running story! I didn't know you have been a running star practically since you were 8! I'm always amazed at runners like you who have have a natural talent for & love for running. My love for running is very recent & definitely acquired. I run to challenge my body & mind, to be outside & enjoying nature...and to buy running clothes, ha ha! It's crazy how everyone's running journey is so different yet we end up in the same place! It's such a universal sport. That always amazed me! And yes. Clothes are a huge motivation to run!! Impressive running history! I never really ran much until after I had kids - an age I'm pretty sure you haven't even hit yet LOL. Glad you brought running back into your life.